My plan is to share my journey with Bigger Pockets by making posts detailing every big milestone I reach in my Real Estate Investing career. 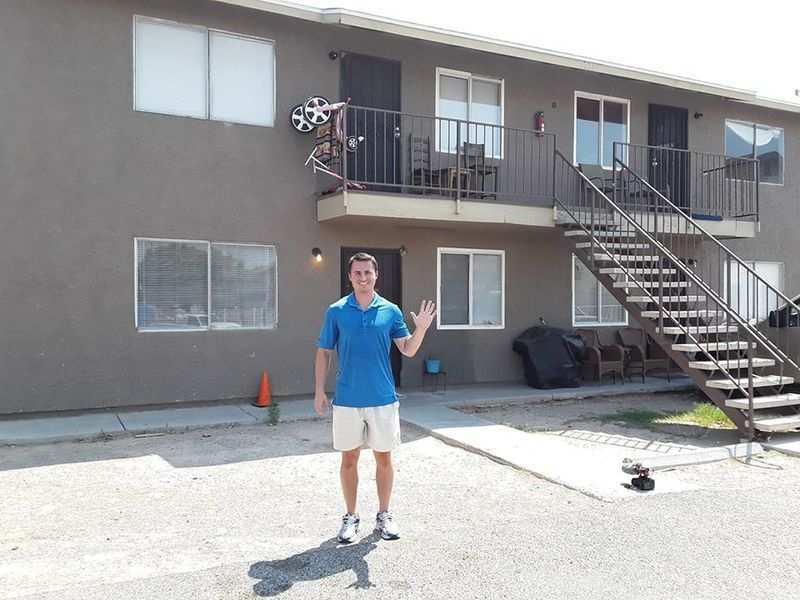 Today I closed on a 4plex in Las Vegas, NV. I shared a picture of me on Facebook in front of the property with captivating text and embraced the never ending likes and comments. What my non real estate investing friends see: Wow Spencer is really killing it. He bought a multi family 4plex today. I’m sure he saved A LOT of money, money I don’t have of course, and put it all on this property. There’s no way I can do it because I don’t have the money! What my real estate investing friends see: Wow great job Spencer, I remember my first property and the jubilation it brings. I’m going to message him and see what the numbers are and see if there’s a story behind this. In my experience, there’s always a story and sometimes the details in the deal are much different than one would imagine. What I see: someone who endured 12 months of anticipation, anger, humility, learning, letdown, stress, joy, and most importantly a mother flipping desire to take control of every facet of every transaction I will partake in in the near future. I’m emotionally exhausted thinking about what transpired over the previous 12 months. Today was me running across the finish line of a marathon I never trained for. The deal is a gold mine. I purchased the property for $260,000 with only $20,000 down. The seller agreed to finance the property over 30 years on only 6.5% interest. The property is worth roughly $300,000 today and, by my expectation, will be worth $350,000 within 24 months. If you want the exact numbers, scroll to the bottom. In November 2017, I was eager to purchase my first investment property. On a salary that did not provide enough to simply be able to save up enough to play ball in this market, I knew I’d need to get creative. I had read a lot about buying lists and writing mailers to property owners. So I figured why not try that! After purchasing enough envelopes to throw off the 1985 NBA draft lottery, I decided to purchase a list from ListSource. My initial plan was to wholesale. I didn’t really have a plan other than to put myself out there and get creative. If a property didn’t make sense to wholesale, then maybe I could find a way to buy it. This post is not about those who called and wanted to 1031. It’s about the one owner who changed my life forever. They (husband and wife) called and said that they would be interested in selling their 4plex for the right price. Eventually, I brought up the idea of me buying the property. I had found out that the seller did not have a mortgage and realized that he may be open to seller financing. I softly pitched him the idea and benefits of seller financing a property. I can’t remember the exact conversations and the order in which I pitched seller financing, but I remember him talking it over with his wife and calling me back letting me know he would be open to it. I wanted to give him a fair offer and one that worked for me. I mentioned that I had $20,000 in cash, that I would cover all lawyer expenses, all closing costs, and any other expense that came up. Keep in mind that this was in early December 2017 and when they agreed to option B above, I was technically overpaying by roughly $15,000. I decided to offer them more for their property than it was worth because they were giving me a great opportunity and I wouldn't have to worry about any PMI with a low down payment, which still made my numbers work. Additionally, I wouldn't even qualify for 25% down on any 4plex so this was my only option. We agreed to the deal with the stipulations listed above. Now is when the fun began. The owner told me that the property needed a little work and he wouldn’t be able to officially sell for a few months, or until the work was completed. He didn’t share every detail with me. I had no idea how distressed he was until months later. At this point, I knew I needed to get him to sign a contract. I didn’t want to make a beginner mistake and just take his word from a couple of phone conversations (they lived NYC). Being too eager to close on my first deal, I didn’t really hear what he was saying. The property was a mess, needed massive upgrades everywhere, and had tenants that needed to be evicted. The property manager had just been hired and needed to basically restart on all of the tenants. Fast forward a couple of months to March 2018. I decide to get a lawyer to draft up a contract agreement for this purchase. I also need to setup an LLC. And I need help closing. I write a check for $9500. He drafts up a legal agreement. I send to owners. They do not sign. They still think the property is months away from being ready to sell. Side note: the sellers are really nice people. They’re not only doing me a solid but they also wanted to make sure the property was 100% ready for me to takeover. And they kept their word throughout the whole process. Keep in mind that I’m still super eager to close on my first property. Every month that passes by is another month of me thinking I’m getting a deal when I hadn’t really gotten any closer to closing. After not hearing from them for a little while and not sensing any progress towards closing, I call them and let them know I’d be willing to increase the interest rate from 5% to 6.5%. I can’t remember the exact date of this, but interest rates were rising. And most importantly, the values of 4plex in Las Vegas were rising by the week. Fast forward a couple of months to August 2018. The owner is close to being ready to sell and decides it’s time to find a lawyer. During this month, I talk to owner over multiple weeks and hear of him continually looking for a lawyer. I also hired an inspector to inspect the property for me. Nothing major found. He even said it went as well as expected for a 4plex in Las Vegas. I’m now even more ready to close. At this point, I’m currently out of pocket $10,000 and still don’t have any official document showing I will be buying the property. This was very emotionally stressful for me. He finally finds a lawyer. Per our agreement, I pay his lawyer fees which amount to $2,000. I am ready to close. Now that we both have a lawyer, I believe closing should be happening any week now. And I’m up to $12,000 out of pocket. Side note: at this point, I have been speaking about this 4plex to every one I meet for at least a month now. It was very frustrating constantly talking about a deal that never seemed to close. The seller’s lawyer takes forever to respond, habitually. 10 days to respond here, 6 days to respond there. Completely unacceptable. Tick tick tick. The clock keeps moving forward and we haven’t closed. Then he has the gall to go on vacation for multiple weeks in September. Still haven’t closed. October comes and he’s finally produced the documents to close. But my lawyer goes on vacation for two weeks. Side note: my lawyer was amazing and patient throughout the whole process. If you need an awesome lawyer in Las Vegas, I have your guy. Now I’m still out over $12,000 to close on a deal that was supposed to close multiple months ago. I was very annoyed. Very emotionally drained. This lawyer (his not mine) got paid, is taking his sweet time, and causing me stress. Side note: at any moment, the sellers could have walked and I would have been out $12,000. His lawyer taking forever was opening me up for risk of the sellers walking. I never sensed this as the owners developed a good relationship with me over the time we had been communicating, but it’s a greater than 0% chance. November comes. Looks like everything is lined up to close at the end of this month. 3+ months too late, but I’m still getting a hell of a deal. The owner has finally signed official documents and we pass off everything to title. I confirm with title that they will close on November 30th. They confirm. I make sure all documents are with title company multiple days before their deadline. So of course what happens. Title company sends me an email on November 29 at 5pm saying they will not be able to officially close on November 30th. Of course. Because what else would you be doing for 2 weeks but NOT GETTING READY TO CLOSE ON THIS PROPERTY. At this point, I nearly go nuclear. I’m done dealing with incompetence and people doing their absolute best to trigger me. I’m so enraged. After a year of dealing with this property, there was no more fitting conclusion then having the title company saying they can’t close on the day they say they would close. Why do they even exist. At this point, I become even more interested in block chain SO THAT ALL OF THESE INCOMPETENT ***** CAN GET MOVED OUT OF THE WAY IN FAVOR OF BLOCKCHAIN. My thoughts aren’t polite. I want nothing to do with anyone standing in my way between closing this deal. I contemplate getting my license for everything so I can fire everyone in my life. Their reasoning was that because the owners lived out of state, the title company wouldn’t be able to receive the official docs back in time. This must have been the first time this incompetent title company ever attempted to close a property with an out-of-state owner. So of course I had to wait a few extra days. But not without anticipating a closing on Tuesday only to find out that the county would take another day to officially record. So the title company said there would be no problem closing on the property on the 30th, only to then officially close December 5th. When you first begin looking into real estate investing, you envision the only issue that exists is simply not having enough capital. Well my friends, dealing with people who only care 1% about your business, who get paid before getting the job done, and do their best to slow down your operations is what will cause more headaches than not having enough money will. I can’t trust a single soul other than myself. I must be adamant about ensuring everyone involved in my operation is 100% in line with what I’m trying to accomplish or it will cost them. Either cash today or missing out on big business later. Here's a picture of me in front of the 4plex. It is located in Northeast Las Vegas. The 5 represents the number of units I own. such a closer!! CONGRATS DUDE! Spencer I'm so proud of you buddy! You deserve this, great work. I know how much of a burden this was for a while, I'm glad you stuck with it. Be ready for a lot more headache ahead. My last client to buy a 4-plex sold it within 6 months for a loss.. It was that bad.. Better to lose money than to deal with all that nonsense..
@Spencer Cornelia Can you put this into a training or webinar? @Brandon Sturgill I'll probably make a YouTube video with the details. My channel is my full name. @Brandon Carriere there are repurcussions to buying bad deals. Thankfully, this is not one. @Account Closed "If you really got a deal you should sell and cash in." Telling people what they should do without knowing their goals is a waste of air (or shall I say characters on a screen). The property has great cash flow for $20k down payment and I believe I will have ~$140k of equity within 6-8 years. Why would I sell now? Even more importantly, you aren't aware that the seller wants the monthly cash flow because he just retired which is why he gave me the opportunity for seller financing. I wouldn't screw him over for a quick $20k of cash (my net after closing costs). "Cash flow never materializes on these Vegas cash cows." Not sure what your intentions were with this quote. It's not a cash cow given the low down payment but the rents will increase ~$200/month total by 2020 giving me ~$900/month cash flow on a $20k down payment. Solid numbers. I know from experience most of these 4-plexes are highly neglected dumps, and attract the absolute worst of the worst tenants. Yours appears decent on the outside so maybe you got the turnkey gem of the century, but the fun is just beginning dealing with leasing to the riff raff..
@Spencer Cornelia . Do you foresee rents going up a lot in the future? I don’t see much cash flow on this deal as it stands currently. Was your loan amortized over 30 years to or is there a ballon payment in there? I hope the market doesn’t correct like it did 10 years ago. You don’t have much equity to work with if it does. Did you have a agent pull comps to verify value? Why did you have to pay 9500 up front ? @Caleb Heimsoth Yes, my property manager said that a similar unit rents for $800/month down the street. I don't think mine will get that, but they should get to $700/month a unit when these tenants move out or over the next 2 years. Amortized over 30 years, no balloon. I do have a good bit of equity. I owe $240k and it's worth roughly $300k. Yes agent pulled comps. Lawyers demanded money up front. All of the major cap ex have been completed so my capex/repair budget is going to be pretty low. I'm also not looking at this as a cash flow income source. It's a long term play with ability for huge equity in 6-8 years. @Account Closed "i just gave up" - something I don't do. What was the address? What was the purchase price? Why did cash flow never materialize? That area of town is less than ideal. Look for all Section 8 tenants if you’re lucky...VEGAS is an odd market. The multi family properties are junk for the most part until you get to 100+ units. That leaves you with single family or needing millions to buy a large multi family properties. I wish the OP well but I’d never buy in the NE part of Vegas. I wonder if there is any way to break out of the D regulars and get into affordable C level airbnbs, flip the script style. Good luck! Or halfway house, senior living..something needed for locale. @Dennis M. thank you. Yes, over time, this thing will be an A+ property given the low down payment and potential for future appreciation and rent increase. Add in the tax benefits of this property which will be a paper loss and it's a huge ROI. @Matt R. I'm not interested in AirBnB, especially in Las Vegas, but I'm sure that could be an option for some people. @Remone Randolph thanks man. @Account Closed seems like he has experience and probably just bought a bad deal. Brandon - mind sharing the address and numbers on that property? @Spencer Cornelia Congrats on your first purchase. I’m not going to bash on you like some others, just wanted to caution you to solely rely on “the numbers indicate this will be a great deal”. I owned several units (20+) in Detroit about 10 years ago and the numbers indicated that they would give me huge cash flow gains. The problem is these D class tenants rarely pay. I think it was @Jay Hinrichs who said you would likely only collect 7-8 months a year, which might even be generous. Main issue is when there is a turnover. Even if they leave the place in decent shape, having to fork over $3,000-4,000 to turn the unit kills the cash flow for the whole year, even if you budgeted for cap-ex/maintenance. Good luck to you, my suggestion is to try to get the absolute best tenants you can. Sign them to long term leases and check the condition frequently. @Saj Shah thanks man. These are probably 'D' class for some people. Some may consider them 'C'. I walked the property during inspection and met the tenants. These aren't gang members or low class people that live in these. It's low income but they were nice, family oriented, and pay every month. There will certainly be tenants here and there that don't pay, but I'm not expecting huge amounts of uncollected rents. Also, how did it cost you that much to turn the unit? These units are cheap tile, cheap $200 cabinets from Home Depot, and pretty low cost appliances. Prove us wrong .........Put up your monthly financials so we can follow. My guy wont touch these with a 1,000 foot pole. I dabbled in one of what you bought at a way way lower price point. Like the earlier Realtors client i just gave up the flow of cash never materialized. Not to mention the quality of tenants you get is not what stuff of dreams are made of. one of my partners bought two of these in 2012 ish I think at the bottom of the cycle for just over 100k each 4 plex they were wrecks he put about 60k into each.. and the cash flow or cash Faux was so spuratic he just donated them to his foundation.. now not every one has a foundation like he does .. but he did much better on the 150 to 170k SFR's he bought at the time.. they doubled and the tenants actually paid.. this is rough stuff so got to be careful..
@Jay Hinrichs there are a lot of 4plex in town that are less than ideal, I get that. The address on this is 1550 Northwind Ct 89110. There haven't been many sales in the area which doesn't make sense if the tenants are crap, not paying, and causing a lot of headaches. Given the rapid appreciation of the multi family market in Vegas, it doesn't make sense for these owners to hold 4plex with >$100k of equity if it isn't cash flowing. Which tells me the tenants in this area aren't as bad as some may postulate.